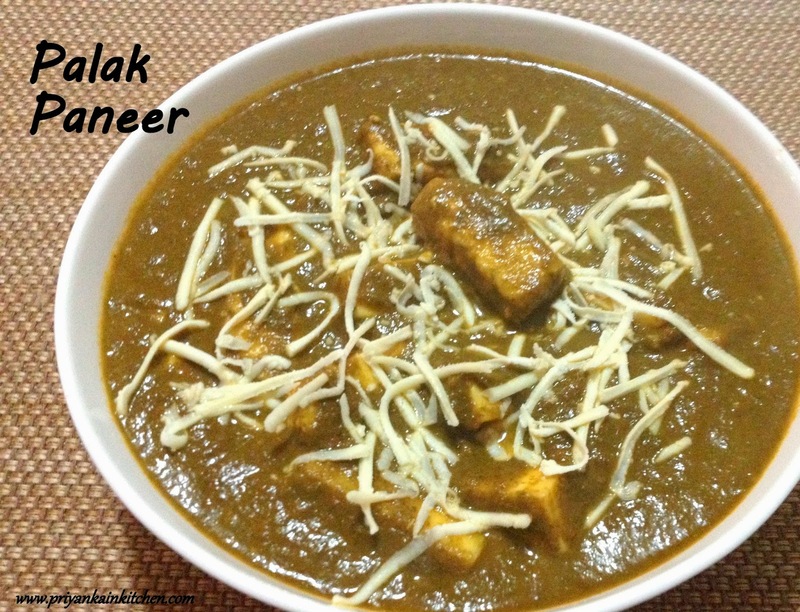 Palak Paneer is a mild curry in which Indian cottage cheese, Paneer is cooked in spinach ie Palak gravy. The combo of protein and calcium rich paneer with vitamin and mineral rich spinach makes it highly admirable. Boil water in a sauce pan. Add washed spinach to boiling water. Let it cook for 1-2 mins without cover. Turn of the heat, strain and let it cool. In a blender, blend onion with chilies to a smooth paste and keep aside. Blend tomatoes to puree and keep aside. Blend cooled spinach. Don't over blend. Few pulses are sufficient. When its hot add onion paste to it. Fry until it starts to leave the edges. Add tomato, coriander, cumin and garam masala. Fry again until it starts to leave the edges. Add spinach, salt and sugar. Add water to adjust the consistency. Add paneer pieces and cook on high until first boil and then on low for 2-3 mins. Serve hot with with any Indian bread or rice.